Dan Tritle of WCAI (Cape & Islands NPR) caught up with us again this season. This time, Greg mainly talked about his experience being one of the owners of the Walla Walla Sweets, who just completed their inaugural season as a ball club in the West Coast League. The West Coast League is a wood bat summer league similar to the CCBL, and currently features nine teams from Washington, Oregon, and British Columbia. Dan Tritle (WCAI-FM) caught up with CodBall's Greg Shaw for a 2009 end of season interview on Monday, August 10th. If you follow college baseball, chances are you are either a regular reader of The College Baseball Blog or you've stumbled across it in your online searches. The blog's creator is Brian Foley, and he sat down with us for a CodBall Conversation after the recent rain-shortened Cape League All-star game at Fenway Park. Whether you find Brian online or in person, he conveys the weary sense of a man never too far from his computer. The number of games and announcements he juggles is staggering. Claims of size and depth on the Internet are often exaggerated but Brian's claim to be the "ultimate source for college baseball news and notes" is pretty accurate. Sitting in Fenway Park's press box on a rainy summer evening, I was curious to learn how he does it and why. I've commented in the past that the bookshelf is beginning to sag beneath the weight of books about the Cape Cod Baseball League. There are narrative accounts of a season, historical accounts reaching back over 100 years, picture books and guides. What has been missing has been a novel, a SABR-like encyclopedia and a children's book. Well, wait no longer for the children's book. This summer Cape Cod's own Diane Troy has written along with illustrator Charr Flloyd a delightful children's book for Mascot Books. Floyd's anime-inspired illustrations are fun and distinctive. I like the Anglers cartoon where the outfielder looks like a ghost from Scooby-Doo in the fog. I emailed author Diane Troy to ask her a few questions. What interested you in writing a children's book about the Cape League? I've been a player host mom for 20 years and am also merchandise coordinator for the Chatham Anglers. I spotted the publisher's books on Wally the Gren Monster and Patriots football and felt a story about the CCBL would also be marketable, as printed by Mascot Books. What ages would you say this is best geared to? Being illustrated, it would appeal to children between 3 and 10, but it would also serve as a souvenir from one of the Cape League games, especially if it's autographed by players from various teams! Where can someone get a copy of the book? Books are available at : Barnes & Noble Booksellers, Hyannis; the Cape Cod League Hall of Fame, Hyannis; 9 franchise locations in the CCBL, a dozen private bookstores on the Cape; and from me, personally via dtroy823@yahoo.com. Does the league benefit from sales? Every dollar benefits the team selling it. There is no compensation to me as author. The book is just another merchandise item that can be sold to support the Chatham Athletic Association/Chatham Anglers. Surprisingly, the book now needs to be reordered ...a mere seven weeks after delivery. EDITOR'S NOTE: CodBall continues its partnership with WCAI/WGBH NPR for the Cape and Islands. Broadcasted on Monday morning June 8th, Dan Tritle and I previewed the 2009 Cape season, and we interviewed Tom Simon for the latest CodBall Conversation. Its history reaches back as far as baseball itself, and this Thursday the Cape Cod Baseball League begins its 124th season. Over the past several years WCAI has teamed up with CodBall to bring forward voices and stories from the league. This week our CodBall Conversation is with Tom Simon, who has created a novel game based on statistics emanating from top players in the Cape League over the past decade. For many baseball enthusiasts, the dice game known as Strat-o-matic is an enduring memory from their childhood, one that precedes today’s fantasy baseball and video games. In Strat-o-matic your team’s players are printed on cards with batting and fielding probabilities which are then played out in a game with the role of a dice. NPR four years ago ran a memorable story on the influence of Strat-o-matic. Mr. Simon, an award-winning baseball writer, has created his own Cape Cod version of Strat-o-matic and was interviewed last week from his law offices in Vermont. CB: Tell us how you play the game. Simon: You've got one four-sided die, which looks like a little pyramid, and two ten-sided dice that generate numbers from double-zero to ninety-nine. If you roll one or two on the four-sided die, you look at the batter's card for the result; if you roll three or four, you look at the pitcher's card. If you roll a low number like double-zero, especially on the batter's card, you've got a pretty good chance of an extra-base hit; if you roll in the 90s, it's probably a strikeout. There are some nuances -- if you roll doubles, for example, there could be an error -- but that's the game in a nutshell. It's pretty simple. CB: So who are some of the players contained in the game? Simon: The Cape League's website has statistics for the past ten seasons, so I made what amount to all-decade teams for each of the League's ten franchises. Some of the players are established Major League stars, like Mark Teixeira, Chase Utley, Evan Longoria, Kevin Youkilis, and Tim Lincecum; a lot are guys you've never heard of unless you're a scout or a serious Cape League follower; and some, like Matt Wieters Aaron Crow, and Grant Green, are guys you may not have heard of yet, but soon will be stars. All told, I made cards for over 270 players. CB: This winter you played a complete 44-game Cape Cod League season; who won and what surprised you about the game? Simon: Chatham came on strong at the end to beat out Orleans in the East, and Falmouth and Wareham were first and second in the West. In the finals, Falmouth took two out of three from Chatham for the dice Arnold Mycock Championship Trophy, with pitcher Dallas Buck of Oregon State taking home the PA Sports Ticker Playoff MVP Award by pitching a complete game four-hitter in the rubber match. As for what surprised me, this might sound a little self-serving but I was amazed by how realistic the results were. The cumulative batting average for the Cape League over the past ten seasons is around .247; my dice league batting average came to .246, and the percentages of doubles, triples, strikeouts and walks were almost dead-on. The only significant difference was that my league hit a lot more homers. CB: How did you get interested in the Cape League? Simon: Every serious baseball fan knows about the Cape League, and I'd read The Last Best League by Jim Collins, which is a fantastic book that follows several members of the Chatham A's through a Cape League summer, but what really hooked me was when we went to Wellfleet for vacation last year and I got to see a couple games in person. When my kids get a little older I'd like to do a trip where we see a game in each of the league's ten ballparks, and I'm really looking forward to this year's Cape League All-Star Game at Fenway. CB: You are a baseball historian and statistician; why is the Cape League important to the game of baseball? Simon: It brings together many of the most talented collegiate players in the country and pits them against each other, using wooden bats, in a condensed schedule that is similar to what they'll encounter in the minor leagues. If you were a Major League team on an incredibly tight budget, you could do respectably well in the draft, I think, by scouting nothing more than the Cape League. I don't think it's coincidence that the major and minor league rosters of smart organizations like Oakland and the Red Sox are littered with Cape League alumni. CB: How can listeners get a copy of the game? Simon: I haven't made very many of them, but I do have a few, so if your listeners really want a copy, they can contact me by commenting here on CodBall (either comment on this post or send us an email). By the way, I will donate 100% of the purchase price -- not just the profits but the entire purchase price -- to the CCBL. CB: What research was needed for you to make the game perform realistically? Simon: This may get a little "sabermetric" for many of your listeners, but first you have to total all of the league's statistics to determine what percentage of plate appearances result in home runs, triples, doubles, singles, walks, and strikeouts. Then you do the same thing for each individual player, and the numbers that go on his card depend on how much he deviates from the league average. You could do the exact same thing for any baseball league that keeps detailed statistics -- I did it for the New York-Penn League back in 1996, when the Vermont Expos won the championship, but you could do it for your son's Little League if you wanted to. In Field of Dreams, Shoeless Joe tells Ray that if he builds it (the field) they will come. The Cape Cod Baseball League might as well have a parallel quip, "if the scouts don't come, neither will the top talent." I had the great privilege recently of spending a little time with one of the great scouts, Mel Didier. Mel is currently with the Texas Rangers but also played important roles with the Los Angeles Dodgers, the Montreal Expos, Seattle Mariners, Baltimore Orioles and Arizona Diamondbacks. "I don't know of anyone who has been in more baseball parks throughout the world," Fred Claire, one-time GM of the Dodgers, told the New Orleans Times-Picayune. I ran into Mr. Didier recently in Yakima, Washington, where his son, former major leaguer Bob Didier, was managing the Single-A Yakima Bears of the Arizona Diamondbacks organization. Over dinner late one night after a Bears game and then the next day at lunch, I listened to Didier tell captivating story after story about players and games I remembered from television or from books. One story is how he stood in the Dodgers locker room prior to the 1988 World Series game with the Oakland A's. He looked over at the left-handed hitters who happened to be sitting together, and told them that if they are facing Dennis Eckersley with a 3-2 count they were guaranteed to see a back-door slider. We all know the legend that follows. The injured Kirk Gibson stepped in to pinch-hit. Sure enough, he faced Eckersley with a 3-2 count. Suddenly he backed out of the batters box and told Didier later that he could hear the old southerner's twang in his head, "look for the back-door slider." In a new memoire, "Podnuh, Let Me Tell You a Story," Didiere tells the story of his rise to prominence in baseball, which began as part-time scout. Didier signed and developed some of the top talent in the game: Andre Dawson, Larry Parish, Steve Rogers, Dave Henderson, Ralph Garr and others. I especially enjoyed Didier's account of his unlawful scouting mission to Cuba, where he was only able to escape with the assistance of none other than Fidel Castro. CodBall's Greg Shaw sat down with Dan Tritle (WCAI-FM) to discuss the end of the Cape League season on August 15th. Greg talked about how the season ended and the always-hot issue of players leaving early. Since we announced our partnership with WCAI on December 10, 2007, we have provided a number of exclusive interviews including: John Garner (CCBL PR and Broadcast Director); John Wylde (Wareham Gatemen President), Part 2; Judy Scarafile (CCBL President), Part 2; Paul Galop (CCBL Commissioner); and Neal Conan (NPR's Talk of the Nation). The voice that projects regularly and vociferously the words known to all Cotuit Kettleer fans -- "HAVE A HIT" -- surely cannot belong to this sweet 80-something year-old man with a walker and a hearing aid. He is Ivan Partridge. But, alas, here he is in front of me at the conclusion of an important late summer matchup between his beloved Ketleers and the cross-town rivals, the Hyannis Mets. Cotuit's defeat of Hyannis guarantees Cotuit the western division championship. And so Mr. Have a Hit, Ivan Partidge, is happy, practically giddy. I have waited several years to get this interview. I've talked with league officials, players, authors, media stars and others, but it is Ivan that I've wished to interview for so long because I believe he so embodies the spirit of the Cape Cod Baseball League. This former Episcopal clergyman and now super-fan of the Cotuit Ketleers is an energetic and knowledgeable baseball fan who enjoys his renown in ballparks both home and away. In celebration of the Cotuit Ketleers' bid for the CCBL championship, we offer you this CodBall Conversation with Ivan Partridge. Have you ever wondered if a copy of the 1935 World Series broadcast is available? Long forgotten, 1935 was the year the Detroit Tigers won their first World Championship over the Chicago Cubs. Or maybe you remember seeing vintage film footage in which a Major League pitcher was using his own little movie camera to capture the action at an old All-Star game. Does that player's film footage still exist? There is no better source in the country than Benjamin Harry, media archivist for the National Baseball Hall of Fame in Cooperstown, NY. We met Mr. Harry during the spring when my son wrote a letter to the Hall of Fame inquiring about an obscure major league game that was played in the early 1960s. We didn't expect to hear back, but one day my wife received a call from Cooperstown asking about my son's letter. A relationship developed over email and phone, and then last week we took a break from the action on the Cape to drive to Cooperstown. We toured the museum on a Sunday and then spent Monday morning in the A. Bartlett Giamatti Research Center, located just beyond the broadcast wing of the Hall of Fame. Harry took us deep into the corridors of the Hall of Fame collection. We visited the media vault and the photo vault. And at the end, we sat down for a CodBall Conversation. The National Baseball Hall of Fame is primarily interested in the Major Leagues. We did see a display case dedicated to collegiate baseball (Oregon State was honored there). And in the research center, we found the books you would expect -- the Last Best League, Beach Chairs and Baseball Bats, Baseball on Cape Cod and a few novels that apparently mention the league (Slider and Storm Tide). But the ABNER Library Catalog also revealed a few Cape Cod Baseball League artifacts. We found Inside Pitch: Official Newsletter of the CCBL and two artifacts from Cotuit (Baselines and The Kettleer). Way to go, Cotuit! The Kettleers were the only organization we found in the Baseball Hall of Fame. I know the Cape Cod League's new Hall of Fame opened this year, and I look forward to reviewing it as well. Perhaps we can do a future CodBall Conversation with the head of the CCBL Hall. Neal Conan is best known as host for National Public Radio's Talk of the Nation and as an executive producer of All Things Considered. But this summer he stood in as the play-by-play announcer of the Cape Cod Baseball League's All-Star Game. Conan is author Play-by-Play: Baseball, Radio and Life in the Last Chance League, a book about his experience taking a leave from NPR to serve as a broadcaster in the independent Atlantic League. Conan was interviewed recently by Dan Tritle of WCAI, CodBall's radio partner. I was also interviewed on the broadcast, but let's face it, an NPR broadcaster is a whole lot more interesting than me! To commemmorate the Cape League's Opening Day today at Wareham, CodBall and WCAI (NPR Cape and Islands) teamed up for a new CodBall Conversation with Commissioner Paul Galop. WCAI broadcasted the interview this morning (June 13th). And CodBall has an extended version of the interview. One piece of news from today's conversation was the Commissioner's indication that a settlement appears to be imminent with Major League Baseball. MLB and the CCBL have been in talks over a license and revenue deal. See my letter to Commissioner Bud Selig. Paul was very candid and engaging regarding former players who have made it to the Big Leagues and the teams he has an eye on this season. Tune in and subscribe to our conversations in iTunes. The conversation with Paul Galop is one of our best. Dan Tritle of WCAI (Cape and Islands NPR) has provided us with an extended version of his conversation with John Wylde. A shorter version of this interview is scheduled to air Monday, March 3rd at 7:35am. Topics in the interview range from how John got involved in the league to his favorite Cape league memory. Defying a body challenged by inoperable cancer, John Wylde's voice remains absolutely distinguished. His head for baseball on the Cape is unrivaled. His spirit is unbowed. WCAI/WGBH and CodBall jointly interviewed John Wylde on Feb. 28th from the NPR studios in Woods Hole. Eight months earlier, Wareham Gatemen President and Cape league statistician John Wylde provided one of the most captivating CodBall Conversations yet. To fans of the Cape Cod Baseball League, the name John Wylde is not as well known as some of the players who have come through the league – names like Carlton Fisk and Nomar Garciaparra. But make no mistake about it, these players – and the league itself – have John Wylde to thank. Wylde is the President and Treasurer of the league’s Wareham Gatemen, a position he has held since 1983. He also has served as the Cape league statistician. None of those titles do justice to describing the contributions he has made to Cape league baseball over two and half decades. News this past fall that Wylde has inoperable cancer shook the league and its fans. Cards and flowers flooded into Beth Israel Hospital in Boston where Wylde was undergoing treatment. In an unprecedented move, the Cape League moved immediately to induct Wylde into its Hall of Fame. And the league has declared its season opener this year – June 13th – as John Wylde Day. What did it mean to you that the league moved so swiftly to induct you into the Cape league’s Hall of Fame? While you were in the hospital you heard from some of the players who came through the Cape League? Who did you hear from and what words of encouragement did they offer? How has the league changed over the past 25 years? What is your favorite memory – from a game or season? Look ahead, what is your hope for the Cape league? CodBall interviewed you last year only days before the start of the 2007 season. You and I both had high hopes for the Wareham Gatemen. In fact I believe I picked them to go all the way. What happened? We know your favorite ballpark. What is your second favorite? On Monday morning, WCAI aired a short interview with Judy Scarafile, Cape League President. The interview focused on the previous weekend's events at the Cape Cod Baseball Expo in Chatham. The interview was conducted by Dan Tritle of WCAI, as part of a continued partnership with CodBall to provide Cape League coverage throughout the year. It is the 2nd of our two interviews with Judy. Enjoy! In this CodBall Conversation, we chat with Cape Cod Baseball League President Judy Scarafile about last season and the season ahead. The President of the league led a delegation of Cape Cod Baseball League officials to Philadelphia recently where they attended the annual convention of the American Baseball Coaches Association. As Major League baseball continues to respond to the Mitchell Report on steroids, amateur baseball prepares for the start of the college season in a few weeks. So while it is cold here on the Cape, and summer baseball seems a distant dream, the annual ritual of elite amateur baseball is waking from its winter slumbers. Note to readers: The list of Cape Cod Baseball League alumni at the end of this post remains a working draft and of course will never be truly complete. The League and its teams continue to research and verify the names, affiliations and years on this list. But even in this draft state it shows the immense influence this league has had on the game of baseball. Thanks to the volunteers who have and continue to make it possible.The league continues to update the list and we will make their updates available periodically here on CodBall. The Cape Cod Baseball League's public relations and broadcast director, John Garner (pictured center), is our first CodBall Conversation in partnership with National Public Radio's WCAI and WGBH. NPR's Dan Tritle and CodBall's Greg Shaw interview John about the league and its first ever comprehensive list of Cape Cod baseball players who went on to play in the Major Leagues. The league has graciously given CodBall permission to publish this comprehensive list of CCBL alumni. It remains draft and incomplete, but it is already a gift to baseball lovers everywhere with more than 700 names that date back through the history of the game to the early 20th Century. I found the list fascinating. Two Hall of Famers played on the cape -- Harold "Pie Traynor, who played for the Pittsburgh Pirates in the 20s and 30s. Carlton Fisk played briefly on the Cape. Interestingly, two former Cape players were on this year's Hall of Fame ballot -- Todd Stottlemyre and Chuck Knoblauch. Quinlan, Robb Cotuit, 1997 Quintanilla, Omar Cotuit, 2002 Quirk, Art ? Conor Gillaspie, the Cape Cod Baseball League's 2007 MVP and batting champion, spoke with CodBall early on a recent September morning from the athletic department of the Wichita State University Shockers. Listen to our latest CodBall Conversation. Conor, an articulate and thoughtful collegiate player, also is the #13 pro prospect in the nation and he comes from the nation's #13 ranked college program. Everything about this kid points to serious baseball. We talked with Conor about Wichita State's phenomenal bid in the College World Series and his experience playing with this year's runner-up in the Cape league, the Falmouth Commodores. He gives his perspectives on whether the CCBL is for show or competition and whether it's a pitcher's league or a hitter's league. Justin Smoak, the Cape's 2006 MVP, also spoke with CodBall earlier this year. 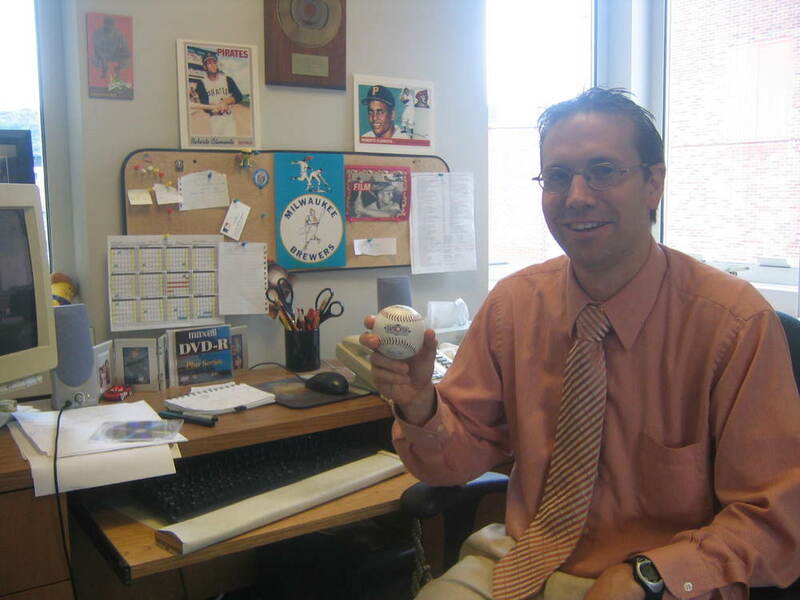 As the 2007 Cape Cod Baseball League playoffs were about to get underway, NPR for the Cape and Islands (a service of WGBH in Boston) talked with me about the league, the playoffs and about CodBall. We thought we'd bring this short interview to you as a CodBall Conversation. Please listen to it and stay tuned for continuing collaborations between CodBall and WCAI. Andrew and I caught up this past week with Jim Collins, author of The Last Best League which chronicles a season in the Cape Cod Baseball League. A number of books examine the storied Cape league, but Jim's narrative account of an entire Cape season is an enjoyable journalistic telling of the players, managers and dynamics of elite collegiate summer baseball. I would go so far as to say it's a must-read for any serious baseball fan regardless of the level of baseball that interests you. CodBall sat down with Jim beneath a big tent behind home plate in Wareham during the middle of the 2007 All-Star game. Jim is a perfect blend of kindness and intensity. He happily accepted our offer for an interview on the spot and leaned into the questions with enthusiasm and knowledge. In this interview, we ask Jim how the 2002 story of the league might be written differently if he were researching and writing it today (less access, he fears). Twice published in a collection of the best American sportswriting, Collins also reflects on his techniques as a writer and his favorite baseball writers. He also provides an audio "afterword" for the book. Listen to our conversation with Jim Collins, and let us know what you think. Cape Cod Baseball League All-Star and Bourne Braves second baseman Kevin Hoef (Iowa) has been among the batting leaders all season, and he stopped to talk with CodBall on Sunday after the loss to Chatham. Through the games of July 23rd, Kevin was batting .326. Kevin talks about his decision to play on the Cape this season, the Braves' run-up to the playoffs, and this weekend's CCBL All-Star game.